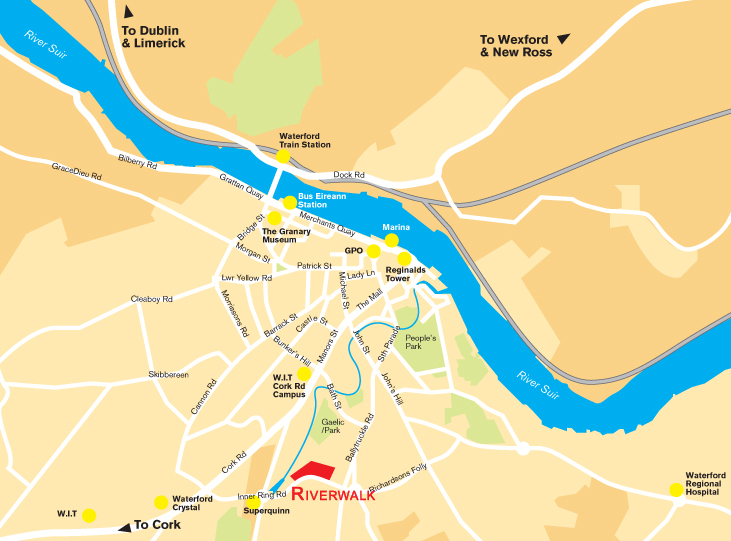 Riverwalk is located on the inner Ring Road in Waterford City. It is located on John's River which winds its way through the city to The River Suir at Adelphi Quay. Built on the banks of the River Suir, Waterford is Ireland's fifth largest city and the main urban centre in the southeast. § From Dublin (Approx 2.5 - 3 Hours), take the N7/N9 from the West of the City, and follow the M9/N9 branch for Carlow and Waterford. § From Rosslare (Approx 1 Hour), follow the N25 for Wexford. Turn left onto the R733, and follow this scenic route through south county Wexford. Cross the Suir estuary by ferry between Ballyhack and Passage East. Follow the signs to Waterford from Passage East. § From Cork (2 - 2.5 hours), follow the N25 through Midleton, Youghal, Dungarvan and Kilmeaden. Follow signs Waterford (N25). § From Limerick (2 - 2.5 hours), take the N24 through Tipperary Town, Cahir, Clonmel and Carrick On Suir. Follow signs Waterford N24, after Mooncoin at the junction with N9, turn right to join N9 and follow signs to Waterford. § Cork serves ferries to and from Swansea, in Wales, and Roscoff and Le Havre in France. § Rosslare serves ferries to and from Pembroke and Fishguard in Wales, and Cherbourg and Roscoff in France. § Dunlaoghaire serves ferries to and from Holyhead in Wales. § Dublin Port serves ferries to and from Holyhead in Wales. § Belfast serves ferries to and from Stranraer in Scotland. § Larne serves ferries to and from Cairnryan in Scotland. Ireland is served by a reasonably effective train service, Iarnrod Eireann, whose main drawback is that it operates, primarily, on a hub and spoke system, centred on Dublin City Centre. Tramore is served by two bus services, Rapid Express and Bus Eireann. Both companies offer services between Tramore and Waterford, which connect with services to other parts of the country.